Know what I love even more than South American mobile libraries? Repurposed buildings. (Well, I love repurposed anything, to be honest.) So when Molly over at bookhopping posted a link to a slideshow of LIBRARIES BUILT IN REPURPOSED STRUCTURES I nearly popped with excitement. And then I followed said link and became downright giddy. Old structures transformed into libraries? Sign me up! High ceilings, open spaces, curved staircases, and books, books, books. Think they’d notice if I moved in? 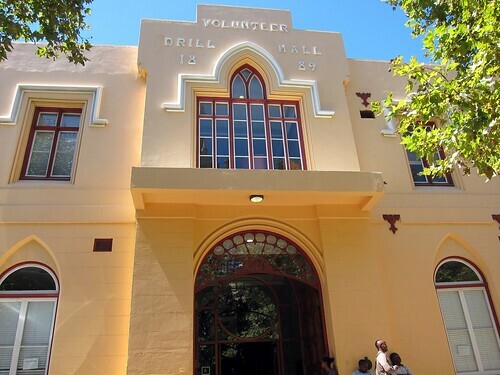 Previously located in City Hall, the Central Library moved into the Old Drill Hall in 2008. 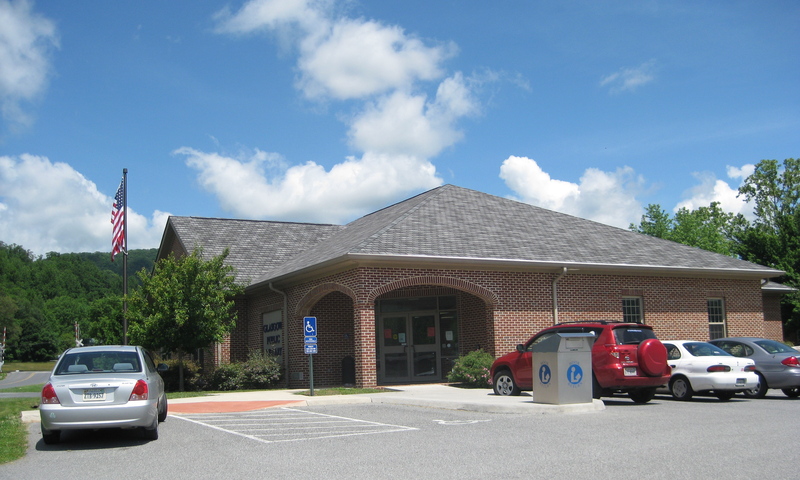 Funds for the library’s move and the renovation of the Old Drill Hall came from the city and a $2 million grant from the Carnegie Corporation. The library has meeting rooms, a bookshop, study areas, regular children’s and adult programs, and free internet and wi-fi. They also have an extensive collection of books, including a “Professional Children’s Collection” for research purposes (okay, now I’m really moving in) and reading material in all eleven (eleven!) official languages. 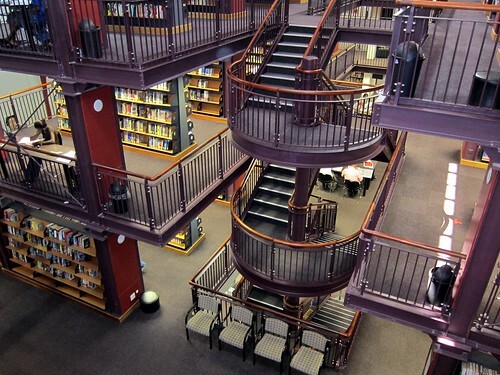 The library is the largest one in the Cape Town area and gets close to 70,000 users a month. Well, I’m sold. Anyone else want to go to Cape Town with me? Three hearty cheers for the Central Library! Read the Library Love Fine Print here. This is the Bicicloteca, operated by Robson Mendonça, age 61. Inspiration for this mobile library came to Mendonça during his homeless years, when he was unable to check out books from his local library because he didn’t have a permanent address. 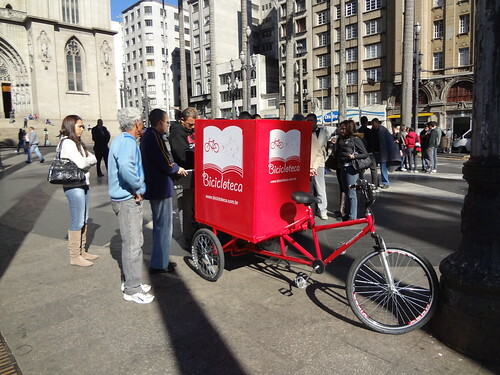 With the help of the Instituto Mobilidade Verde, Mendonça created the Bicicloteca (a combination of the Portuguese words for “bicycle” and “library”). 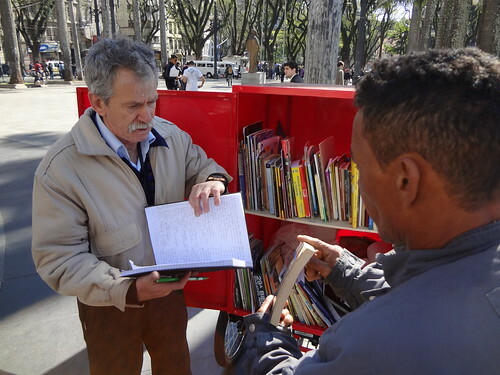 Now he rides around São Paulo, Brazil, loaning books to anyone he meets, including the homeless. Borrowers can either return their books to the Bicicloteca or pass them along to someone else. In just the first four months of operation, Mendonça loaned out over 4,200 books, 90% of which were returned. 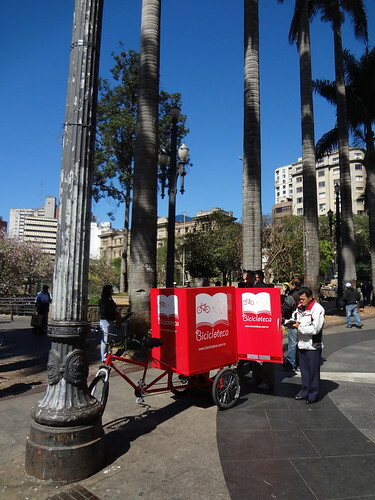 The Bicicloteca is capable of carrying up to 150 kilos of books (approximately 300 books). There are over 17,000 donated books in the Bicicloteca’s collection, and Mendonça hopes to one day have ten Biciclotecas in operation throughout Brazil. As an employee of a public library, I understand the “permanent address” rule. Even with that requirement in place, we lose a lot of materials and fines every year. It would be wonderful to view those lost materials in a positive light – at least they’re out there, hopefully enriching someone’s life – but unfortunately, most of our (very limited) funds come from taxpayer money and we have to account for every penny spent. This is one of the reason I love libraries in all forms, be they public or private, government, individual, or community owned. No single person or organization can do everything, but we all can do something. And maybe one day all those somethings will add to up everything. Hats off to you, Robson Mendonça. Three hearty cheers for the Bicicloteca! Sources: Bunge Foundation, InfoSurHoy.com. If you can read Portuguese, be sure to check out the Bicicloteca and Instituto Mobilidade Verde websites (and then tell me what they say!). Faced with the prospect of losing their phone booth, residents of Westbury-sub-Mendip (located in southwestern England) decided to buy it from British Telecom for £1. Shortly thereafter they learned that BT was holding a national competition for innovative uses of these old phone booths. After tossing around a few ideas during a tea party, one of the residents came up with idea of transforming it into a book exchange. Having recently lost their mobile library service just a few months prior, this was the perfect solution. Shelves were installed and filled with books donated by the residents. 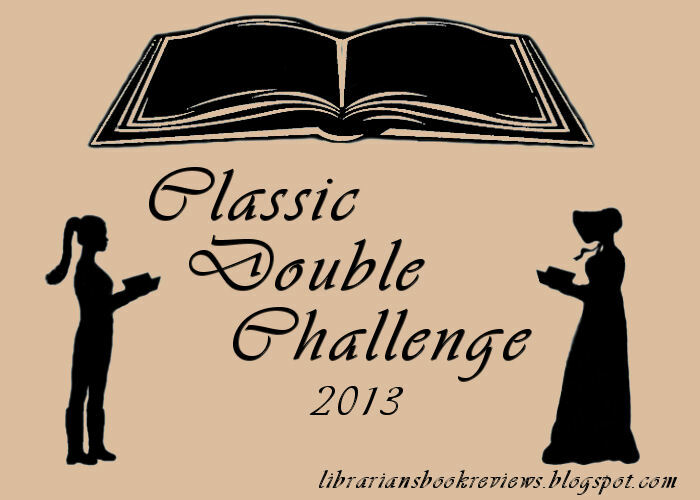 The guidelines for using the book exchange are simple: take a book, leave a book. There are over 100 books in the Westbury Book Exchange and the turnover rate is high. The shelves are regularly monitored and any books that aren’t moving are donated to a local charity shop. The phone booth is lit at night and it stays open 24/7, 365 days a year. Community response to the mini library has been overwhelmingly positive; the residents treat it with respect and the shelves are always full. Three very hearty cheers for the Westbury Book Exchange! Last weekend I decided to explore a section of the Blue Ridge Parkway I’ve never seen, so I drove up I-81 N and then cut over to the parkway via VA-130. The weather was absolutely perfect for a road trip – brilliant blue skies filled with puffy clouds and temperatures in the mid-70s. The mountains are beginning to take on the darker green hues of summer, but splashes of bright spring green still speckle the hillsides. On my way to the parkway I stopped in Glasgow, Virginia, a small town (population approximately 1,000) in the foothills of the Blue Ridge Mountains. The purpose for this pitstop? 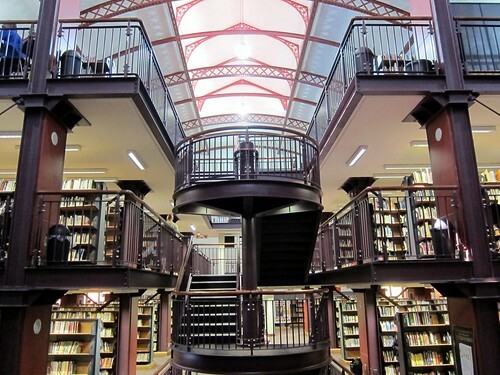 The Glasgow Public Library. Three cheers for the Glasgow Public Library! 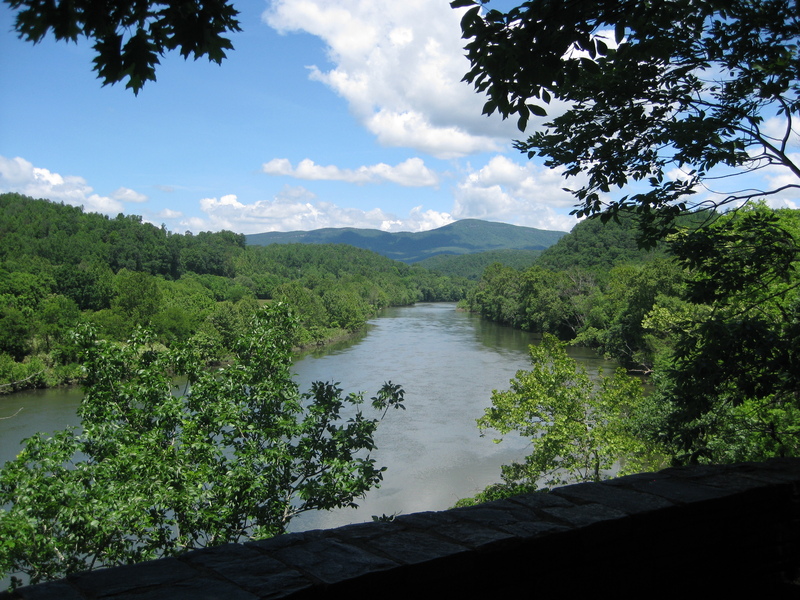 The James River, approximately 10 miles east of Glasgow. This 1979 Ford Falcon – a popular car with the Argentinean armed forces during the dictatorship – is now an “Arma de Instrucción Masiva” (“Weapon of Mass Instruction”). Created by artist Raul Lemesoff as a “contribution to peace through literature,” Lemesoff drives his tank around Buenos Aires and nearby rural Argentinean communities giving away books. There are approximately 900 books on his tank, all courtesy of private donors. I suppose I can’t really call this a “library” since the books don’t have to be returned, but I think the Arma de Instrucción Masiva is still a library in spirit if not in practice. It is a celebration of literature and education, freedom and peace, which are all ideals at the heart of most libraries. The fact that Lemesoff created this “Weapon of Mass Instruction” out of a tank is not only highly symbolic but just plain awesome as well. ¡Tres hurras por Arma de Instrucción Masiva! Sources: Arma de Instruccion Masiva (Lemesoff’s website), Automotto, Good Culture, Inhabitat, The New Yorker. Photo credit: Super Furry Librarian. Be sure to Google it for more photos! Needless to say, I was pretty wowed by this. The library definitely took an innovative approach to creating an environmentally-friendly building. It will be interesting to see if they continue to stay ahead of the curve. But wait! There’s more! Before writing this post, I poked around the Des Moines Public Library website a little and discovered that it’s one of the best library websites I’ve looked at so far. It’s has a clean layout and is easy to navigate, and it’s clear that the staff puts a lot of effort into maintaining the website. Nowhere is this effort more evident than on their “Blogs/Wikis” page, which provides links and descriptions of the five blogs and wikis maintained by the library. I’m a big fan of their “Bookshelf” wiki, which shows the covers of the latest books read by the staff. It’s a simple, yet effective, site: it gives the library some personality while providing book recommendations to the patrons. I would love to see my library do something similar. Three cheers for the Franklin Avenue Library!